Work at height training is an idea that typically requires little explanation. Industries which use equipment such as scaffolds, mobile towers and powered access are well aware of the dangers they pose, and most involved with this line of work understand that falls from height are the biggest killer in the workplace. For a number of reasons, however, the same cannot always be said of those using ladders. Two surprisingly contradictory reactions to the idea of ladder training are common – people either believe that ladders have been discredited and should be avoided, or they believe that ladder use is so simple that training is unnecessary. Back in 2005, the former of these misconceptions was heard so often that the Ladder Association adopted ‘Ladders are not banned’ as its mantra. After the publication of the Work at Height Regulations 2005 (WAHR) in the UK, a rumour began to surface that the regulations had entirely banned ladders. Campaigning with the UK’s independent regulator for work related safety, the Health and Safety Executive, the Ladder Association has helped to dispel this myth, but it has proven difficult to shake completely. What these regulations actually require is simply, as with all work at height, that a risk assessment should be carried out first to confirm that a ladder is sensible and practical for the situation. Specifically, in tasks with low risk and short duration, or where the location of the work lends itself to their use, ladders can be an excellent choice. Great strides have been made since 2005 towards banishing the belief that ladders should be avoided, and upcoming simplified guidancefrom UK regulators will further clarify good practise. The opposite idea that ladder use is simple enough to require no training, however, can be harder to dispel. Ladders’ ubiquity means they are used in almost all industry sectors, so a coherent safety message can be difficult to get out to everyone. The message, though, is a simple one. Ladder training is vital because falls from ladders can be a serious safety issue, and regulations require that in the absence of any other means to prevent a fall or to protect from the consequences, the only available option is training, instruction and supervision. While it may seem logical that falls from the highest areas would be the most dangerous, it is important to note the frequency of low level falls. It could be argued that part of the reason the UK regulator began to legally require ‘competence’ from anyone working at height was due to RIDDOR statistics published in a 2003 Health & Safety Executive research report on prevention and risk control effectiveness, showing that 60 percent of falls were ‘low falls’ from below head height. Statistics also show that in fact almost a third of the major injuries sustained in falls from height come from ladders. This should not be seen as the result of ladders being particularly unsafe compared to other types of access equipment – it is possible that people’s indifference towards safety on ladders as compared with other forms of access equipment is a major contributor to the number of injuries sustained on them. Training, therefore, is a useful factor in helping to prove competence, and it is for that reason that training has become increasingly important to those industries in which ladders are used extensively. Ladder training can take a number of forms, depending on the type of ladder and what it is being used for, but a number of simple rules exist which should always be considered. As emphasised above, the first and most important test before selecting a ladder for work at height is risk and duration. Ladders can be a good choice for low risk, individual tasks lasting up to half an hour. Alongside this, there are a number of other rules, many of them straightforward, forming the foundation of safe ladder use. Ensuring that the ladder is tall enough to comfortably carry out the work required seems like an obvious rule, but the temptation to overreach upwards can be a common one, and may be hard to resist in some situations. This brings us to another ladder use expression to bear in mind: ‘If it’s right to use a ladder, use the right ladder and get trained to use it safely’. Obviously selecting the right ladder for the job is the best way to prevent overreaching – the variety of ladders available in the workplace means there should always be an option which avoids the temptation to stretch too far. Overreaching to the side can be just as common as stretching upwards, of course. The test recommended to ensure that this does not happen is that the ladder user’s belt buckle should always be between the stiles of the ladder. For maximum stability, the next rule is that when working on leaning ladders a hand hold must be maintained and both feet should be on the same rung. Finally, the positioning of the ladder can be one of the most important factors to consider. The one-in-four rule comes in useful for gauging this – for every four units up, the ladder should be one unit out from the wall; so, for example, an eight metre high job would employ a ladder which is placed two metres out. Ladders must also be tied in wherever possible. This greatly reduces the possibility of a fall from height and, while it may not be possible in every situation, it is important to do so if practical. These rules are not intended as a comprehensive guide but do take into account a wide a range of typical ladder uses. The potential variety of ladder work, however, means that different situations may require the specialised knowledge that comes from training. Just as with any piece of work at height equipment, a ladder’s condition can be as important as the choice of ladder itself. As such, another important facet of safety comes through checking ladders before using them. Most of these pre-use checks are fairly simple, and the UK regulator advises that they should be carried out on ladders every time they are used, or, for ladders used throughout the day, carried out at the beginning of the working day and any time something changes; for example, the ladder being dropped or moved between different types of area. For leaning ladders, basic pre-use checks go through three stages. First it should be ensured that the stiles are not bent or damaged – if they are, the ladder could buckle or collapse. Next, the feet should be inspected, as missing, worn or damaged feet could easily lead to the ladder slipping. Finally, the ladder should not be used if any rungs are bent, missing or loose. Stepladder use also involves all of these rules, but their additional parts must also be checked. It is important first to confirm that the locking bar is working properly, and is not bent, worn or damaged. The platform should also be checked – a split or buckled platform can lead to collapse. The steps or treads should also be inspected for any contamination which could make them slippery. The importance of inspection standards cannot be overstated – good quality ladders can be as vital as competent people using them. 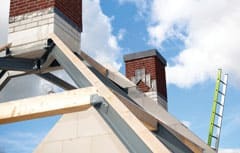 We have seen for ourselves the life threatening state equipment can get into – last year Birmingham City Council sent us a case study about a local builder’s merchant prosecuted for numerous work at height issues. Interestingly, the company did in fact have a safety policy in place which required that they check for compliance in accordance with site rules every week, thoroughly inspect their ladders every six months, and destroy any equipment which could not be properly repaired. Despite these measures, officials found a total of nine ladders in conditions which would have been life threatening if used – it was discovered that none of the required checks were actually being carried out. The most startling thing about this story was the condition of the ladders. Pictures showed extensively damaged, warped stiles, cut off feet and twisted rungs. The ladders were clearly unfit for use, yet were in storage ready for anyone to pick them up. The merchant was fined more than £8,000, which would have undoubtedly been higher if someone had been injured. This case study is one good indicator of why different types of ladder training are important for both users and supervisors. Training itself from a reputable authority aims to achieve a list of learning objectives which are taught over a one day course. Understanding of key points is then tested with a theory and practical assessment. Good practise in such training involves delegates being taught to assess and determine when a ladder or stepladder is appropriate for the task, correctly locate and safely use the correct type of ladder, and have an understanding of the issues surrounding ladder work. In particular this involves understanding the law and standards which affect ladder use, hazards in their use, and storing and handling them effectively before and after the task. While this type of in depth course is of most use to frequent ladder users who may use the equipment regularly in their daily work, the unique position ladders have of being a feature of almost every workplace means it can be useful to offer other courses for more infrequent ladder users – people who work in shops, offices, schools and the health sector. Typically this type of training involves working with stepladders and step stools, which are of course more likely to be used in such situations. Compared to the more intensive course described above, this less in depth training has a shorter duration, although the same form of theory and practical assessments are conducted on completion. A third type of training, ladder inspection, relates to the condition of the equipment itself, rather than the capabilities of the person working on it. Inspection training teaches delegates about when it is appropriate to inspect ladders and what details they should be looking for and recording. As the Birmingham case study shows, it can be hard to ensure that unsafe equipment is discarded, but progress has been made by incentivising firms and people to get new ladders. In 2007, the UK’s work safety regulator launched the first Ladder Exchange, a campaign which encouraged users of old, bent or broken ladders to trade them in at companies across the UK in exchange for a discount on a new ladder. The success of the Ladder Exchange, between September and November 2012, was a particularly encouraging sign that awareness of the ladder safety message has been growing. The number of ladders traded during the 2012 Exchange jumped 35% from 2011’s figures. The popularity of the scheme also showed in the number of people interested in training, with an all-time record set for one provider who, two months into the Exchange, reached a new monthly high of almost 1,000 people attending courses. The Ladder Exchange’s success both in getting dangerous ladders out of the workplace and in getting more people safely using ladders is excellent proof that ladder safety efforts are on the right track. Currently, the focus of ladder training is on expanding take-up outside of the large firms which have so far been most involved. Ladders’ ubiquity among different types of businesses can be useful, but equally it can be a major contributing factor in the disproportionate part that ladders play in falls from height. The less frequent stepladder and step stool users in, for example, the retail and facilities management sectors require a different approach than the more specialised work at height industries. This is a problem which cannot be solved by one simple solution, but rather will be a gradual process. A unique programme is being launched to encourage supermarkets, hotels and similar businesses to become more involved in training their staff to recommended levels. It is also important that individuals who use ladders occasionally in their homes are not overlooked; ensuring that basic safety information is promoted to the point that the public have some understanding of the best way to use their ladders is an important part of getting a coherent safety message out as widely as possible. In the future, another way of expanding awareness of ladder safety and good practise is likely to be via improving communications to the small to medium enterprises, microbusinesses and individuals who regularly work at height, as these types of organisations are typically the hardest to reach with safety messages. These people may go without training either because they are not aware of the danger, because they do not know the latest safety requirements, or because they short-sightedly see it as more cost effective to cut corners. Among the worst examples of these are the types of people the Ladder Association has previously labelled ‘Idiots on Ladders’. This was a campaign based on the belief that the best way to show the importance of safe ladder use is to display what the worst of unsafe use looks like – both encouraging people to see the dangers, and shaming the most dangerous into thinking more carefully about what they are doing. The winner of the campaign is worth noting as a perfect example of the worst that can come from having untrained people using ladders at work. He was shown breaking a number of the rules we have previously outlined: his ladder sat between the roof of one building and the chimney of another, with a gaping fall directly below him and a bucket wedged between the ladder and the wall. The fall would certainly have been lethal, and he shortened the odds further as his ladder was not even long enough – he still had to stretch upwards. In the course of the contest 38 pictures were submitted, and more are still being uploaded onto our Facebook page to this day. Some of the most outrageous misuses led to fines – such as the gardener who had one leg on a ladder and the other on a tree branch while he used a chainsaw to cut off the tree’s other branches without using safety equipment. He was made to pay a total of £6,000 in fines and costs. Training people and raising awareness of sensible practise can seem like a hopeless task when scrolling through those pictures, but it is possible to see the positives that came from asking the public to help find examples of ladder misuse. The fact that people felt the need to photograph even the less dramatic examples is proof that they understand it is unacceptable, and know what stupid behaviour looks like. Equally, people’s willingness to comment and vote on the biggest ‘idiot on a ladder’ shows an understanding of the dangers posed by untrained users. Most people are not idiots on ladders – as with any form of access, they just need the right training and equipment to stay safe. This message is one that has become clear throughout all of our work. Ladders themselves continue to be a very useful option for a wide range of work at height tasks, but like any other access equipment they can only be employed properly if they are in the right condition and people using them understand what they are doing.